Watch the video above ! Simply click on the arrow in the center. 2 Bedroom 2 Bath Condo. Sleeps 7. The multi-million dollar renovation project is now complete. Finally !! The condominium complex is gorgeous. Ebb Tide remains the nicest complex in New Smyrna Beach !! . Just a few steps to the ocean ! Brighthouse with 300 plus channels and 40 music channels. DVR to record shows. High Definition wide screen. Exquisitely professionally decorated. Widesreen high definition 55' Samsung television. Over 300 channels to watch ! Over 120 high definition channels ! Over 40 music channels to enjoy ! High definition digital video recorder (DVR) Wireless high speed internet that is secured. Bring your laptop or tablet. Wet bar and wine rack. Gated luxury condominium. Best located condo in the complex (2nd floor). Quick access; walk up or ride the elevator. No cars on the beach in front of Ebb Tide. Heated pool. Jacuzzi. Tennis. Exercise facilities. Television in each bedroom. Washer/dryer. Garage parking. 2 large outside industrial Weber poolside grills 1750 sq.ft. including terrace. King size bed in the master. 2nd bedroom has a queen bed plus a bunk bed with full size mattresses. Free phone calls to all states, Canada, Puerto Rico, Virgin Islands. Guaranteed clean. Also check out our 3 bedroom in Ebb Tide (listing # 14171) and our 4 bedroom Penthouse (listing # 1157) next door at Surf and Racquet. Absolutely no pets or service animals. Great location, great view. Everything needed at our fingertips. Unit clean and comfortable. We stayed the week and the unit had everything we needed. Clean and comfortable. And the staff was extremely accommodating and helpful. The view is amazing. The pool is maintained daily. The beach front was gorgeous. Although a few minor upgrades may be needed we loved it. We hope we can come back. If you have a rental car you are 10 minutes from great restaurants nightlife, groceries, and shopping. This was our 1st vrbo. Different that hotel living. Remember to buy your own paper products and soaps. I loved it ! The unit was very nice and roomy for the five of us. Pool area was nice and beach was fun. Overall great place to stay. We are so happy you enjoyed your stay in the condo. 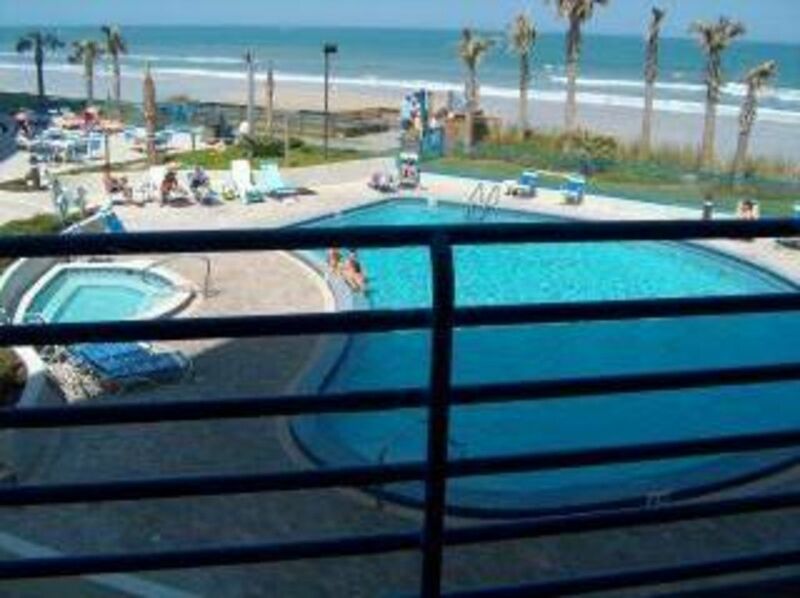 My family loves New Smyrna beach and this condo is situated perfectly. The pool and hot tub were amazing and the condo was very comfortable for my family of 6. It was a little chilly when we went so the heated pool and the hot tub were where we hung out the most but the beach is just amazing too. We took many strolls on the beach and enjoyed watching the kids play in the sand. There are a couple of bikes in the garage and my husband and I rode them on the beach which was fun and relaxing. This is definitely the place to go if you are looking to spend qt with your family. We will absolutely be back! I have loved visiting this amazing beach for the last 7 years, but this was by far the best experience I've had with condos. They went out of their way to accommodate us, and the view was outstanding. The only thing I regretted was that it wasn't closer to Flagler. I enjoy being able to walk to it easily. That is minor compared to the experience we had though. I wouldn't hesitate to stay here again, and I love that it is close to the National Park. We are so happy to hear of your wonderful vacation experience. I, too, wish we could walk to Flagler Avenue, but then you are on the driving part of the beach. We are less than 5 minutes away by Uber ! The location to the beach could not be better, however, the condo is in need of some updating. I was also surprised there was no book of information about the condo property or things to do around town like many condos we have stayed in. We found a few dirty things when we arrived and notified Hazel, who was very nice, but it did leave us with an unpleasant first impression. I liked that the owner put so much info on the app but clearer expectations about checkout would be appreciated, e.g., laundry, trash and dishes. This was our first time in New Smyrna Beach and we loved Flagler Street! We already have several local suggestions around town as well as our favorites already on the app. There are also checkout instructions including laundry instructions already on the app. Will add some instructions concerning trash and dishes. Thanks for your feedback. Short drive to Orlando, St Augustine, and Cape Canaveral. Weekly rental is from Saturday to Saturday. Credit cards and Paypal accepted for the security deposit of $500. Balance is due by check 30 days prior to arrival. Returning guest discount: Subtract 10 dollars off your rate for each prior stay with us.